The optical properties of nanoscale materials are exquisitely sensitive to their local structure, composition, and shape. Gold nanoparticles (NPs), for instance, can absorb green or red light, depending on their size . Two-dimensional (2D) materials such as transition metal dichalcogenides (TMDs) sustain excitons that can be maneuvered in energy; their corresponding bandgaps vary as a function of thickness and composition . While this sensitivity provides an exciting opportunity to tune light–matter interactions, it leads to large NP-to-NP and area-to-area variations and often results in heterogeneous broadening of the ensemble response. In these cases, reliable structure–property relationships can be obtained by performing spatially resolved optical spectroscopy, typically followed by structural characterization with electron or scanning probe microscopy . Traditionally, spectroscopy relies on exciting a circular area of a sample with a focused probe, such as a laser or electron beam. The signal is then dispersed in energy and acquired on a camera that records intensity along the energy axis NE. The probe can be scanned over the sample, along both x and y with a dwell time t, to yield a spectrum image of dimensions Nx × Ny × NE in txy units of time. This raster-scan approach to acquiring a hyperspectral datacube becomes prohibitively time consuming when considering large areas. To overcome this limitation, several parallel acquisition schemes have been developed for optical spectroscopy, which have been reviewed elsewhere [4, 5]. One typical approach is the use of a tunable filter and a pixel array camera, enabling the acquisition of a range (albeit narrow) of wavelengths at a time; an Nx × Ny × NE datacube can then be acquired by scanning the filter’s wavelength . This comes at the cost of spectral resolution given the intrinsic wavelength spread (few nm) of the filter and the number of frames acquired. The acquisition time indeed scales as tdE, where dE is the energy step, and is ultimately indicative of the energy resolution. Another approach is the construction of a datacube by physically scanning the position of a spectrometer, acquiring one spectral dimension and one spatial dimension at a time (“push-broom”) enabling the acquisition of spectral information across the field of view. This allows for varied energy resolution, limited only by the spectrometer’s dispersion, and saves time by reducing the acquisition time to ty . In this paper, we describe Micro-Extinction Spectroscopy (MExS), a novel optical characterization technique that can capture information regarding a variety of light–matter interactions in nanomaterials. In MExS, a LabVIEW interface orchestrates a piezoelectric sample stage, a spectrometer, and an electron-multiplied charge-coupled device (EMCCD) camera to acquire one lateral and one spectral dimension at a time, and then scans the other lateral dimension by moving the sample stage. Because it scans a line of pixels instead of a point, this approach greatly reduces the acquisition time, which scales as ty (line scan) rather than txy (point scan). This approach also allows for excellent spectral quality, and is therefore advantageous compared to creating datacubes via stacking energy-filtered images, which compromises spectral resolution. Finally, the size of the datacube is not limited by the field of view, but rather by the travel range of the (piezoelectric) stage. Many types of samples can be explored using MExS due to the various optical modes that MExS can support, including transmission, reflectance, and darkfield scattering. We have implemented these three optical capabilities, and describe a case study for each (“Results and discussion” section), demonstrating the applicability range of MExS. The MExS setup (Fig. 1, and Additional file 1: Figure S1) consists of an inverted microscope system (Nikon Eclipse Ti), a piezoelectric stage (Physik Instrumente P-545.3C7), a spectrometer (Princeton Instruments IsoPlane SCT 320 equipped with a 50 grooves/mm grating), a 1024 × 1024 pixel array EMCCD camera (Princeton Instruments ProEM-HS: 1024BX3), an imaging camera (QImaging QIClick), a 12 V 100 W halogen lamp (Nikon D-LH/LC) for transmission and darkfield measurements, and an LED lamp (Lumen Dynamics X-Cite 120LED) for reflectance measurements. For scattering measurements, a dry darkfield condenser (Nikon, N.A. 0.95–0.80) is inserted in the optical path before the sample. The microscope is equipped with two objectives (Nikon CFI Plan Fluor 100XS Oil and Nikon CFI S Plan Fluor ELWD 40×) and an 80:20 beam splitter that sends 80% of the light to the spectrometer and 20% of the light to the imaging camera for simultaneous optical imaging and spectral measurements. The dimensions of the acquired dataset depend on the spectrometer slit’s height and the stage’s range of motion (Table 1). The x dimension is defined by the slit height and scales with magnification (325 μm for the 40×, 140 μm for the 100× objective). The range of motion of the piezoelectric stage (here, 200 μm) defines the y dimension. The spatial resolution is diffraction limited, and the spectral resolution is defined by the choice of dispersion grating. 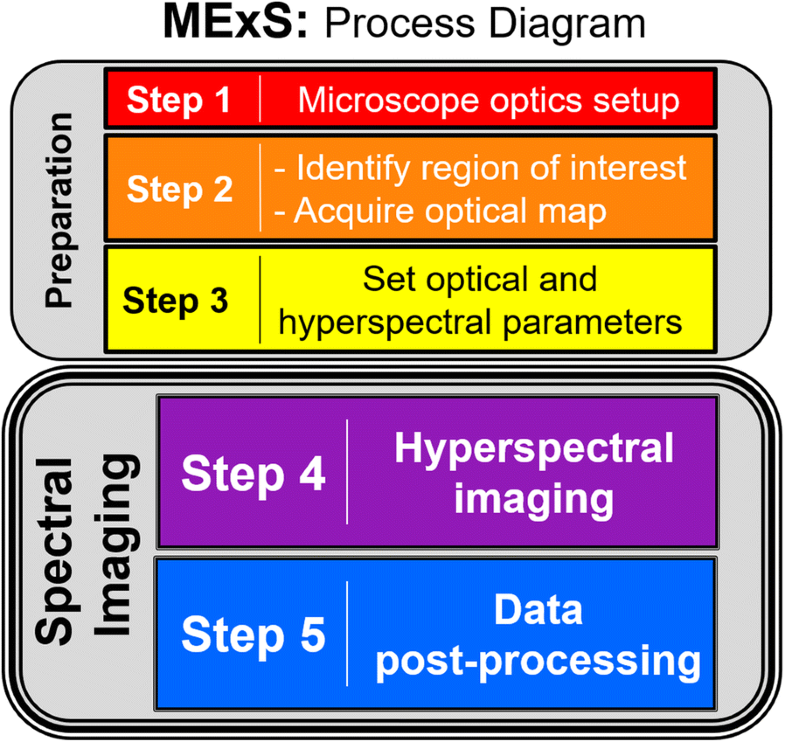 Figure 2 shows the five steps involved when performing MExS. Prior to spectral imaging, the optical setup is constructed, and the sample is mounted onto the stage of the microscope. An image of the region of interest (ROI) is acquired using the imaging camera, creating a map used in data acquisition and analysis. The optical and hyperspectral parameters are then set; example parameters are shown in Table 2. Next, hyperspectral imaging is initiated, and data are exported in comma-separated value (CSV) files. Finally, experiment-specific post-processing calculations (Table 3) are performed on the data. The operation of this hyperspectral spatial-scanning technique relies on communication between two components: the sample stage and the detector system (Fig. 1). This communication is established and manipulated through a LabVIEW control (LabVIEW block diagram in Fig. 3a, LabVIEW user interface in Additional file 1: Figure S2). At the onset of the experiment, the LabVIEW code enters the “Initiate Software” mode. Once both software programs have been initiated and a line of communication has been established, the user enters the spatial-scanning hyperspectral parameters (step size, number of steps Ny) into the LabVIEW user interface. The user then advances the LabVIEW program into the “Acquire Data” mode; the detector and stage are manipulated in series to record data and move the sample Ny times. At each step, the detector system records 2D matrix with a spatial dimension (Nx) and a spectral dimension (Nλ), the lengths of which are defined by the EMCCD chip size, where Nx= 1024 and Nλ= 1024. An Ny stack of these 2D matrices creates an x–y–λ datacube (Fig. 3b). The piezoelectric stage used here employs a closed-loop system that records with high-precision the actual displacement of the stage, eliminating any significant concerns of hysteresis or stage drift on the measurement timescale. All scanning is done in the y-dimension. MExS can also be adapted for time-resolved studies, where time substitutes the y-axis, i.e., the stage remains immobile, and the detector records data for one row location (y) over time. In this setup, the user assigns the time-lapse parameters (number of time-lapse acquisitions, Nt, and acquisition frequency), and a series of 2D matrices (Nx, Nλ) are recorded, leading to an x–λ–t—datacube (Nx, Nλ, Nt). In the post-processing step (Fig. 4), the previously exported 2D matrices are imported into the Matlab-based analysis software (code structure in Additional file 1: Figure S3, code details available upon request). The datacube contains up to 1024 × 1024 × Ny elements for spatial-scanning experiments and 1024 × 1024 × Nt elements for time-lapse experiments. The datacube is first integrated along the λ dimension to create an integrated spectrum, resulting in a picture-like 2D x–y matrix (Fig. 4c). The pixel locations for each ROI are then determined using the integrated spectrum image. These pixel values are then used to extract the λ element values (point spectra) within the datacube corresponding to the selected ROI. An ROI usually covers several pixels, such that several point spectra in a square array around the center of the ROI are typically added together. Experiment-specific computations (Table 3) are then conducted on the extracted data. The processed data are displayed (Fig. 4d) and written to CSV and Matlab workspace files. Three case studies are described below. For each, a brief background is followed by key findings to exemplify the scope of applicability of MExS. TMDs have recently gained much attention because of their potential applications in electronics [8–11] and optoelectronics [8, 12–14]. At monolayer thickness, TMDs can exhibit direct electronic and optical bandgaps ranging from the visible to the near-infrared. Optical spectroscopy techniques such as photoluminescence (PL) and Raman are currently the key methods used in studying TMD properties such as bandgap energy, [15, 16] emission efficiency, [17–19] and defect density [19–21]. 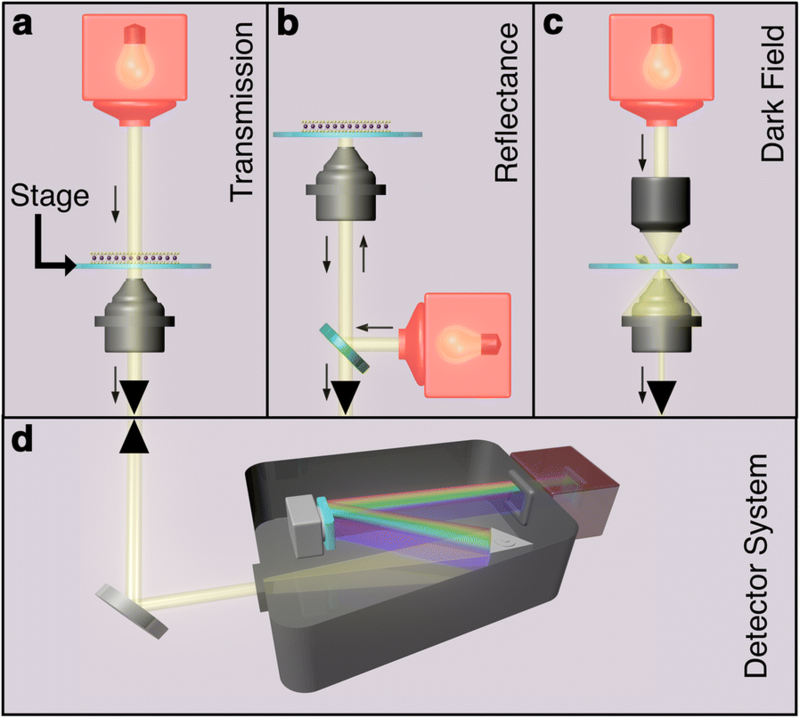 However, PL and Raman spectroscopies have limited quantum efficiency, making them unfit for high-throughput applications. The already-limited PL emission efficiency decreases sharply with increasing defect density. Moreover, both require rather specialized instrumentation [22, 23]. Because photons are absorbed regardless of the quenched PL emission, transmission MExS can overcome some of the yield limitations of PL, while providing simpler and faster operation than either PL or Raman. MExS is a fast, large-scale approach to determine the optical bandgap energy and the extinction efficiency of TMDs. 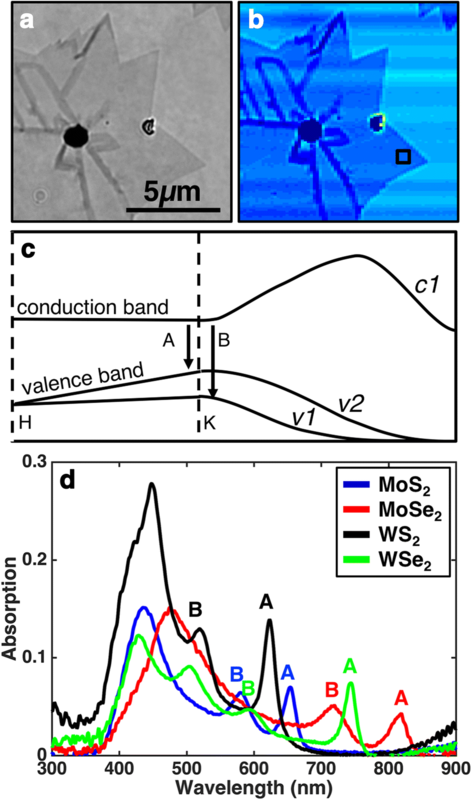 In this case study, MExS in transmission mode is used to identify and characterize monolayers of MoS2, MoSe2, WS2, and WSe2 (Fig. 5). The samples were grown by chemical vapor deposition on quartz coverslips based on previously published techniques [24–27]. An example of optical image and wavelength-integrated hyperspectral datacube (forming a 2D image) is shown in Fig. 5a, b, and the rest are shown in Additional file 1: Figure S4. The exciton peaks of the different TMD monolayers arise from direct bandgap transitions (A and B) at the K point of the Brillouin zone (Fig. 5c). Since the different TMDs have different bandgap energies, the position of the exciton peaks provides an accessible way to identify each material. MExS in reflectance mode provides additional characterization functionality, opening the door to the study of nontransparent materials inaccessible with transmittance. Typical growth substrates for TMDs and other 2D materials (e.g., Cu and Si wafer) are opaque, as are many electrode materials (TiN, C) and surfaces of interest for antiwear/anticorrosion coatings (steel and other metal alloys). In this case study, the interaction between WS2 and a TiN substrate was observed as an example of TMD behavior in corrosive environments, demonstrating the applicability of MExS to nontransparent substrates. The samples used in this case study were prepared by using a micromechanical exfoliation technique that is described elsewhere . The stacked layers of WS2 are held together via van der Waals interactions, whereas the base layer is held to the TiN substrate via strong covalent bonds [28–31]. Various conditions were applied to these WS2/TiN samples in order to simulate corrosive environments. Because the bandgap of the bulk state and monolayer state of WS2 vary significantly (1.3 eV vs. 2.1 eV, respectively), the exciton energy can be used to track the layer thickness, providing insight into the effects of corrosive environments . The integrated spectrum images (Fig. 6a, b) are referenced against the corresponding optical images (Fig. 6c, d) to locate the region of interest (identified here by an arrow). 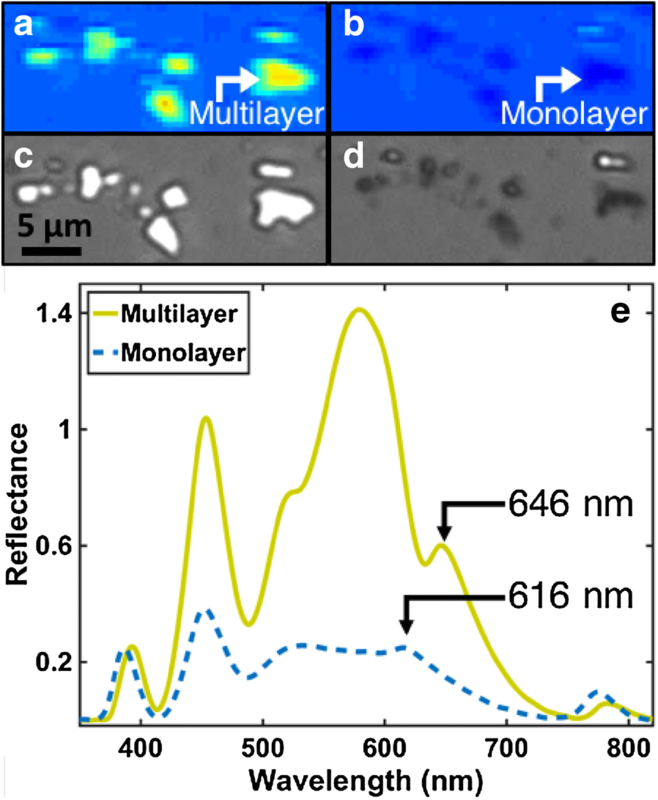 The reflectance signal contains a feature related to an exciton at 646 nm for the multilayer thin film (Fig. 6e). This exciton blue shifts to 616 nm as the film reaches monolayer thickness as a result of corrosion. The use of reflectance-mode MExS offers an opportunity to study large TMD flakes and monitor corresponding substrate interactions efficiently with the flexibility afforded by the use of nontransparent substrates. The FOM can be challenging to obtain because of heterogeneous broadening, requiring single NP measurements. In this case study, we show that MExS in scattering mode can easily provide the large statistics needed to extract RIS and FOM values at the single NP level, enabling detailed studies that are not blurred by the ensemble-averaging of bulk measurements. Three different batches of Au decahedra were synthesized using a previously published one-pot polyol process that allows both size and shape controls . NPs were drop-cast on transparent and conductive indium tin oxide (ITO)-coated coverslips. The coverslips were marked with a scratch pattern for location reference. Coverslips were secured on a custom-built liquid cell and mounted on the microscope stage. The imaging camera was used to collect an optical map of the region of interest (Fig. 7a). Then, a MExS datacube was obtained for NPs submerged in solutions of varying refractive indices (water and glycerol; up to 70% glycerol), providing the single-particle darkfield scattering information needed to determine single-particle RIS. Representative data show the LSPR shift (Fig. 7c) as a function of RI, as well as the RIS (Fig. 7d) calculated from the slope of the linear relationship between the LSPR peak energy of the NP vs. the refractive index of the medium . Each ROI from the hyperspectral datacube can further be investigated with scanning electron microscopy (SEM, Fig. 7e), revealing structure–property relationships; here, the size and shape effect on RIS and FOM is observed. A total of 128 NPs were studied in this fashion (Figs. 7, 8, 9). The size and shape of each NP was measured from its SEM image with ImageJ, an open-source image analysis software. Before correlating the structure and sensitivity of the NPs, we aimed to better understand the features of each of the three NP batches using the side length and tip radius as indicators; note that we report, for easier comparison, the normalized tip radius, i.e., tip radius divided by side length . As shown in Fig. 8, the three samples offer significant structure variety: NPs in samples 1 and 2 have similar side length but different tip radius, while NPs in sample 3 have larger side length and relatively small normalized radius (i.e., sharper tips). Specifically, the average (standard deviation) side length was 81 (10), 80 (8), and 114 (12) for samples 1, 2, and 3, respectively; the average (standard deviation) normalized radius was 0.15 (0.02), 0.17 (0.02) and 0.109 (0.014) for samples 1, 2, and 3, respectively. From these structural variations emerge differences in LSPR properties. 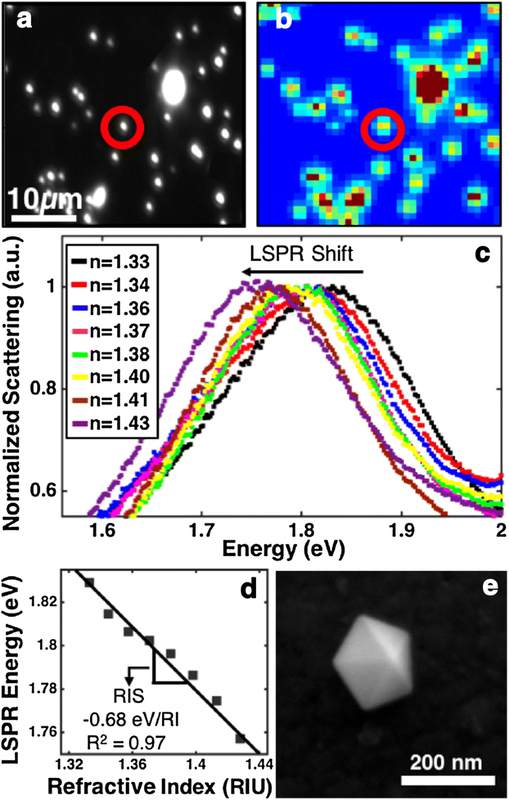 The LSPR energy, as expected, scales inversely with side length, i.e., LSPR energy is lower for bigger NPs (Additional file 1: Figure S5a) . 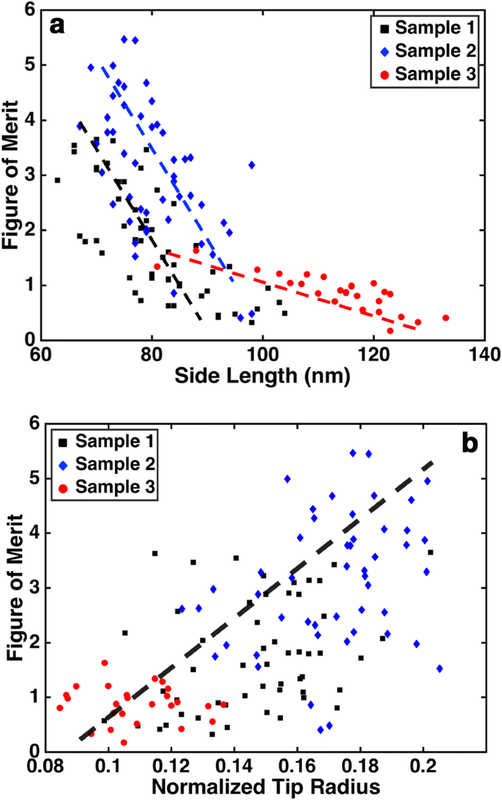 Interestingly, NPs in samples 1 and 2 have similar side lengths yet different LSPR energies because of the blue-shifting effect of corner rounding . Lastly, NPs in samples 1, 2, and 3 show a common trend as a function of tip radius, with rounder NPs having a higher LSPR energy (Additional file 1: Figure S5b). Correlation of the structural parameters, at the single NP level, and the ability to obtain FWHM that are not heterogeneously broadened provides insight on structure–property relationships. MExS/SEM analysis reveals that both RIS and FOM are greatest for small NPs (Additional file 1: Figure S6a and Fig. 9a, respectively). Samples 1 and 2 show large variance in RIS and FOM for NPs of comparable size, which can be attributed to corner rounding effects. A trend is again found by using normalized tip radius as the structural parameter, where rounder NPs are more sensitive and have higher FOM (Additional file 1: Figure S6b and Fig. 9b). These results indicate that side length is not the only structural parameter to be considered when identifying NPs suitable for sensing applications; the normalized tip radius appears to be a unifying structural parameter. 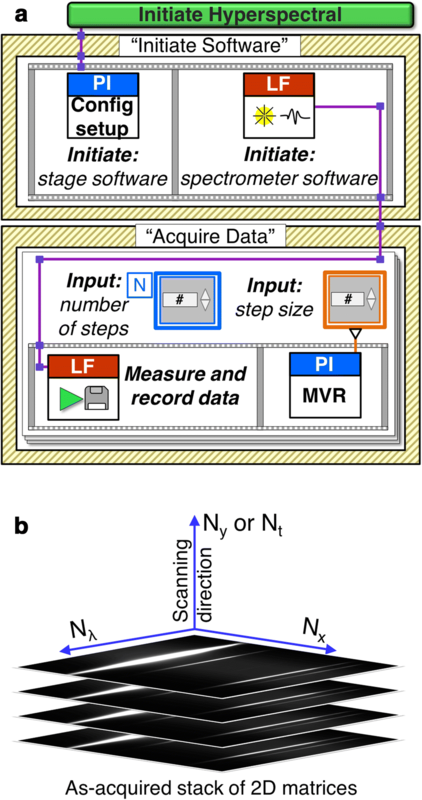 Such study, requiring statistical information on many single NPs and multiple measurements (in different solutions) for each NP has uniquely been enabled by the high-throughput capabilities of MExS and provides useful guidelines for NP selection in the design of label-free (bio)sensors. We described a hyperspectral tool suitable for nanomaterials’ characterization. The automation of the system’s hardware and software relies on LabVIEW, and a Matlab-based analysis s interface was developed for the data post-processing. We presented three different case studies that use the different optical modes in MExS. First, by applying the transmission mode, different TMDs were identified quickly and without the need for lasers, taking advantage of the line-scanning operation of MExS. Next, by applying the reflectance mode, the interaction between WS2 flakes and a TiN substrate was studied. Finally, the optical sensitivity of Au NPs was determined by studying their scattering under different liquid media. We are convinced that MExS is not only effective in the described examples, but can also be used in chemical/biological in situ experiments, thin film and coating analysis, or in situ catalytic mechanism studies. AK developed the data acquisition and data analysis software, and performed the reflectance case study. EV designed optical setups and performed the transmission and darkfield case studies. ER designed the research. All authors contributed equally to the writing of the paper. All authors read and approved the final manuscript. The authors acknowledge P.M. Ajayan and X. Zhang for providing samples used in Case Study 1, and S. Das, A. Sebastian, and V. Huang for collaborations in the electrochemical design of Case Study 2. Data and material available upon request. This research was supported by the Air Force Office of Scientific Research Grant no. AFOSR-YIP FA9550-17-0202, the Binational Science Foundation Grant no. 2016149, and the NSF I/UCRC ATOMIC. E. V. acknowledges the National Science Foundation Graduate Research Fellowship (Grant 0940902). This research made use of instruments in the Shared Equipment Authority at Rice University. 40679_2018_57_MOESM1_ESM.docx Additional file 1. Additional figures.